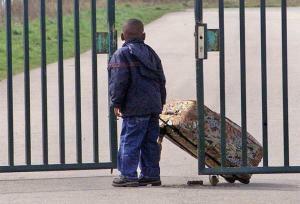 Is Child Detention Really to End? ...because London No Borders have got hold of a letter from a hotel company planning to turn a former childrens home into a immigration detention centre.The letter makes no secret that the facility is planned to replace the use of Yarl’s Wood and nearby Tinsley House detention facilities for holding families and children, and explicitly refers to this fact as an explanation of the need for urgency. The letter also explicitly refers to children inside the holding centre. Lets make One thing clear: imprisonment is unacceptable for adults or children. hotels in Crawley into a holding facility for immigrants in 2010.
weeks, having the detention facility ready by mid-May. pledge to end the detention of children. unnoticed. In this they have failed. So they want your feedback, and we think they should get it. between Monday 7 February 10am and Tuesday 8 February 5pm. spread the word, ask your friends to join #Operation_FirstContact. This morning a Sudanese man from Africa house hurt himself when falling while running from police and has been taken to hospital. Another raid of Africa house, 10 arrests in the morning. There was a mass raid of Africa House this morning. PAF (Police Aux Frontieres) and the new unit of CRS arrived at the back of the building with six vans. CMS activists were immediately removed from the premises and could only watch as doors were kicked in, CS gas was sprayed and over 20 people were arrested. The officers were seen to be enjoying themselves while climbing about on the roof and kept posing for photographs with their guns. One officer remarked to the activists that it was all “just a game”. Still no news of the missing Palestinians. Instead, the PAF has been repeatedly raiding the squats of the Palestininas. Cooking materials were taken over to Palestine House and a large communal meal was cooked between CMS activists and the residents of the house. Everyone had good fun with paint and decorated the walls with Arabic, English and French slogans of freedom. A Palestinian man was arrested and interrogated by police about No Borders. He has now been released. A new compagnie of CRS arrived this evening: unit 11. PAF came to Africa House twice this morning; once at 5.00am and then again at 6.30am. No arrests were made but everyone was woken up by torches being shoved into their faces. The police raided the food distribution place, taking tents that some boys had been living in. They also took all their personal belongings, like clothes and their ID papers. 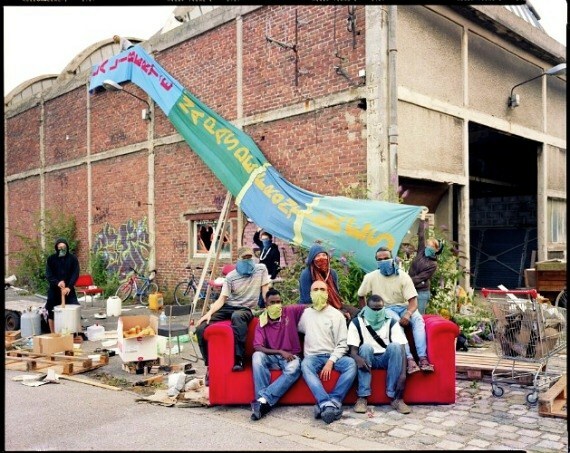 A private squat was evicted – all people arrested. The house was then boarded up. A sound system was taken to Palestine House. People spent all evening dancing and having an Arabic/English phrase swapping session. It was a beautiful night of incredible dance moves and the breaking down of language barriers. PAF arrived at Africa House at 7.00am this morning and tried to batter their way in past the barricades. Once they discovered it was easier to get out of the car and move them by hand they were able to get in. At the moment it seems the police are enjoying playing games and so instead of even trying to arrest people they just drove about inside shining lights and disturbing those who wanted to sleep. One man in Africa House was taken ill and an ambulance had to be called. At first they refused to come out but after the sixth call some paramedics arrived in a fire truck and took him to hospital. He was discharged later that day with a packet of pain killers even though he could barely walk. PAF came to Africa House in the morning but made no arrests. English and French lessons are continuing with great enthusiasm and attendance at Africa House. Todays lessons stretched on for hours – until it was too dark to see the board. Two young Palestinians aged 16 and 18 went to try and cross to England via the Eurostar Tunnel. The two boys hid in a water pipe connected with the reservoir. Two other men who were behind witnessed the scene – one was arrested and held for 24 hours in police station, the other escaped; they say the security let the dog off the lead, the dog had a muzzle on and could not bite but it may have caused the boys to panic and go further into the water pipe, where they may have fallen into the water and drowned. The fire brigade has been searching the bottom of the reservoir, but there is a grill in the pipe before it joins the it. The two Palestinians who were with the missing boys went to the police station yesterday, together with two volunteers from associations to provide information, but there is still no news. It has been three days since the two boys went missing. They had just arrived in Calais and not even the other Palestinians know their names. A CMS activist was also controlled in Carrefour. The PAF (Police Aux Frontieres – border police) drove into Africa House (a squat home to large numbers of African migrants) with great speed, scaring many people onto the roof, but they did not attempt to arrest anyone. Instead, they collected all the artwork that was drying in the corner of the warehouse, bundled it into their van and drove out again blasting music. The Hazara Jungle was raided at 12.30am. Eight PAF officers made three arrests including one man with papers and one underage boy (who was then held in Coquelles for 24 hours). Africa house was not raided this morning but the CRS went there three times pretending to go in, then when everybody ran they went back to their van and drove off. They kept prowling the streets where people use to get to the food distribution site and chased a group of Pashtun children on their way, although no arrests were made. Most of the people in Africa house missed their breakfast for fear of being arrested. At least five people were arrested at Africa House just before 8.00am. The police entered from the back of the building and conducted a small raid on the language teaching cabins. PAF were doing their usual sweep of town, this morning, when they recognised and stopped a CMS activist in the shopping centre. One officer threatened him with a beating and then told him that the police ´Don´t want Migrants here´. At just past 8.00am the CRS pulled into the train station and stopped four Vietnamese people who were waiting for a train. They were questioned for papers and then detained on the pavement outside for over twenty minutes while the police waited for an arrest van. The squat known as ‘Paradise House’ was raided this morning at 10.00am. There are no confirmed arrests. Africa house raided, mass arrests made. Africa house was raided this morning by PAF and CRS around 8 am. They arrived in 5 police vans and two cars with 2 arrest vans. They made an incredibly thorough search of the buildings with ladders, ripping doors from hinges and destroying the barricades to the upstairs rooms. At least 20 arrests were made; all those not arrested were made to leave, including CMS activists and charity workers who were present. Several blankets and the CMS tents were taken by council workers and they bulldozed the small barricade that was set up at the entrance to stop the police entering. After the police left the people returned and CMS activists helped to replace the doors and rebuild the barricades. To lift the mood, paints, brushes and huge rolls of paper were brought to Africa House and some of the more creative residents painted beautiful pictures, wrote poetry and slogans of freedom and love. The CRS have been roaming the streets arresting people at random, in the streets, at the train station etc. PAF breached the agreement with the associations and arrested one man outside the gates of evening food distribution. After a small scuffle with CMS activists and some of the charity workers, PAF drove the man away to Coquelles detention centre where he was held for 20 minutes, finger printed and released. The Iranian squat was closed and boarded up, forcing all the residents to sleep on the streets, in the rain. 7.30am – Palestine House was raided this morning 7.30 am and six people were arrested. They returned two times more during the day without arresting anyone. PAF went to Africa house in the evening around 8 pm, apparently looking for Afghans who may (or may be not) sleeping there. They did not find any Afghans and went away empty handed after searching all the buildings. The Iranians were arrested again and taken to Coquelles as soon as they went to their squat. There was no breakfast provided this morning by Salam. CMS distributed pastries, bread and sandwiches but most people went hungry until lunchtime distribution. The Kurdish Jungle was raided in the night, 5 confirmed arrests, maybe more. The Iranian house was also raided twice in the night, everyone was arrested and taken to Coquelles police station, then, just after they returned to their squat after walking one hour in the rain, arrested and taken to Coquelles again – including a man who is sick with the flu. It seems sleep is a privilege only for those with papers. Hazara Jungle raided in the night, two arrests made. It seems that the police have been spreading a rumour amongst the Migrants that the UK is closed to refugees and that there is ‘ no more asylum to give’. No raid on Africa House this morning but the Iranian house was visited by PAF and everyone was kicked out onto the street. The police are just roaming through the streets picking people up. Many Africans and Afghans, some as young as 10, are being constantly arrested and re-arrested all day. The BCMO – cold weather shelter has now closed because the temperature rose to above freezing today. The temperature has since plummeted with a lot of rain and wind but no sign of the shelter opening again. CMS and all the charity associations have been kept very busy desperately trying to find bedding, tents and waterproof clothing for the over a hundred of people now sleeping on the streets. CRS and PAF have also been very busy chasing them and arresting them when they are most vulnerable. Africa house raided this morning, all CMS Activists arrested. 8.00am – PAF and CRS did a joint operation, entering the property from the front and back. Activists were immediately shoved into a corner and were searched thoroughly. Despite protests, males officers searched female activists. Everyone was then handcuffed and given no explanation for there arrest. The police seemed perplexed that there were so few activists on the ground that morning and asked after specific activists by name..
Before the activists were driven away to the police station they spotted seven arrests of Migrants and what looked like a full scale eviction. Upon arrival at Coquelles detention centre CMS were almost the only people in custody but by 1.00pm the cells were full, with mostly African Migrants. By 4.00pm most of the Migrants had been released but CMS still remained, ears ringing with police threats of jail. The whole operation in Coquelles was very unprofessional as interviews were conducted in busy offices. One activist was locked into a toilet and forgotten about. All activists were released around 7pm. A relatively quiet day in Calais today for everyone. Not too many police on the streets, making only a few arrests throughout the day. CMS activists were able to catch up on the usual distribution of shoes, bedding and sim cards. A very well attended and lively english lesson was conducted at Africa House, (the subject today – irregular verbs) which involved much laughter as the activists had to mime all sorts of strange actions! Two cars of PAF officers arrived at Africa House this morning and decided that instead of conducting a raid on the Sans-Papiers they would beat up the CMS activists who were on morning watch, instead. Batons, fists, and boots were used as activists were thrown to the ground, slammed into walls and choked. A female activist was kicked in the stomach, hit round the head with a baton, thrown to the ground and strangled for trying to stop an officer hitting someone. Another two activists were kicked in the face and thrown into the road for blowing a whistle – the officer (once he had smashed the offending whistle) remarked that we blow the whistles and wake up everyone on the street every morning and that this was not good. He seemed to casually gloss over the fact that he comes to Africa House every morning to wake people up and arrest them, I guess it just goes to show the mentality of the French police – Migrants are not people in their eyes. The CRS spent the morning roaming around and made several arrests of African Migrants who were walking back to Africa House from food distribution. They then followed and tried to arrest people walking back to the jungles out by the ferry port, three people got chased on foot and so climbed the fence into the locked up food distribution area. The CRS followed and climbed the fences catching and arresting two, one guy managed to get out the other side and hide in a garden, the police drove by several times and didnt spot him but unfortunately he didnt get away as a passerby called to the police and showed them where he was hiding. One CMS activist also got arrested after trying to intervene in the peoples escape, he was released four hours later after a full ID check in Coquelles with all the other Sans-Papiers. Everyone got a surprise – including us – when they got to food distribution in the morning to find that all the barbed wire (which usually covers the tops of the fences, turning a space for meals into a prison) had been removed from the fences and placed in the big wheelie bins during the night. CMS activists with the help of some athletic Afghan lads then decorated the fences with banners in English, Arabic and French, wishing everyone a Happy New Year – Free from Borders! English lessons are still continuing strong in Africa House and they are now being joined by art sessions too. Being able to let go of everything in Calais is something very important and so the recent arrival of a portable sound system has been very popular, especially with the young Afghan boys who have delighted in showing everyone some of their dance moves. This evening the music was taken to the BCMO cold weather shelter where within minutes there were over twenty people clapping and watching in awe at an eleven year old Afghan boy and his enchanting dancing. The CRS made an appearance but nobody ran, they just clapped and cheered louder, sending them on their way. Lunchtime food distribution was served by L’Auberge de Migrants who decided to brighten the mood by taping paper table cloths to the tops of the bins. A Samba band from Germany also played some awesome tunes and got people dancing. After about a minutes notice from CMS the Samba band moved out onto the street and (with banners appearing from nowhere) it turned into a small New Years Day noise demo processing up through town to the shopping centre. The locals looked on with smiles and cheers and the small group of activists and migrants grew by one when a passer-by stopped her car and left her husband and children to join in the march – fist raised and chanting loudly! The peaceful, colourful and cheery gaggle of people stopped outside of the shopping centre and a banner was hung from the christmas decorations proclaming – HUMAN RIGHTS HAVE NO BORDERS! Within moments of the banner being hung the police arrived and officers were seen to be putting on riot helmets and pulling out batons. Everybody scattered and the police took chase. Two activists were cornered down an alleyway and choked by police, the banner ripped from them. Two others were controlled and released – nobody else was caught. First of all, a belated shout out to the UWE students who self-organised a benefit gig for Calais, and who made a trip there to distribute the blankets, shoes and other stuff they collected. It seems the French Authorities gave you a hard time…We hope that doesn’t put you off. The situation in Calais can be followed here. Following the hunger strike at Yarls Wood, we now hear that three Doctors who worked for Serco (who run the immigration prison) have been reported to the GMC. This is after “complaints over numerous alleged cases of substandard patient care”. Clearly, this represents a conflict of interests, as even a Tory MP was forced admit: “If there is an issue over fitness to travel and the decision is made by a contracted company inside Yarl’s Wood, what chance is there of having confidence that it has not been influenced by the contract given to the contractors to get people out of the country?” This comes in addition to the Chief Inspectors of Prisons report which concluded that: “children were held at the Bedfordshire centre unnecessarily, with little consideration for their welfare”. Meanwhile, London No Borders disrupted, and gave an alternative, and cogent presentation at Capita’s Conference “Policing the Borders” in London. Watch the excellent film here. Earlier in the week, it was reported on UK Indymedia that one of Sodexho’s outlets had been targeted. A full call out has now been issued for the Brussels No Borders Camp 27th of September till 3rd of October 2010. As well as a delicious vegan meal and an opportunity to hang out socially, we’ll be film screening…. From about 6pm – set vegan meal, for a requested donation of 2 quid. All proceeds to cover costs of meal and pay the bills at Kebele social centre. 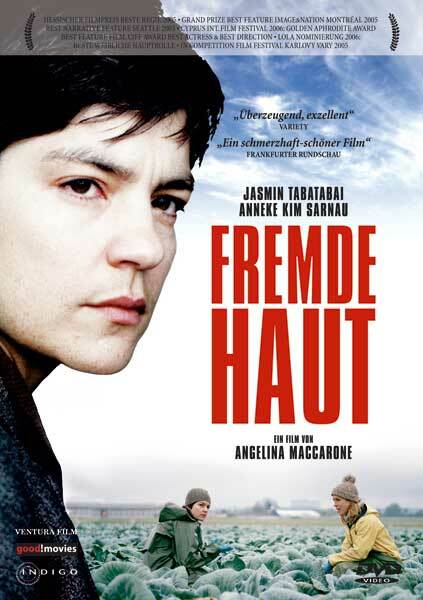 In her feature film Unveiled (Fremde Haut /2005), currently banned in Iran, Angelina Maccarone tells the story of an asylum seeker in Germany without any of the usual clichés. It describes the fate of a young lesbian from Iran who has managed to flee to Germany after her love affair with a married woman is discovered. In Germany she takes on the identity of an Iranian man, who was also trying to escape, and falls in love while working in the Swabian backwoods of southern Germany. It is not just a personal drama, but also a glimpse of the reality for asylum-seekers in Germany – reception centres, never-ending interviews and transition camps. As the days get shorter and the wind gets stronger ……..
As well as a delicious vegan roast dinner, something to wash it down with, and an opportunity to hang out socially, we’ll be film screening…. 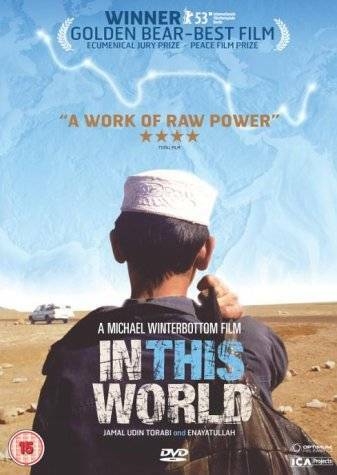 From 7.30pm – “In This World” (2002) – Pashtu/Farsi with English subtitles. This intimate, yet hard-hitting, response to mainstream UK immigration debates follows two Afghan teenagers as they escape from the Shamshatoo refugee camp in Pakistan, along the smugglers’ route known as The Silk Road. Travelling through Iran, Turkey, Italy, and France, Jamal and his cousin Enayatullah embark on a desperate journey to freedom. Short on money, lacking proper papers, and forced to travel in trucks, lorries, and shipping containers. Shot on digital video, “In This World” is styled as a fictional documentary, using voiceover narration and real characters and locations (including the infamous Sangatte camp). The predominantly improvised script creates a powerful piece of guerrilla filmmaking, with two engrossing performances from the non-professional leads. You may remember the demos we held in Bristol and Oxford last year. Well, perhaps inevitably, they lost there legal battle, but as the article below says, having rejected the easy way out and a pay off of £3000 the workers remain defiant in the face of defeat. The Julio and Pedro are an inspiration, against a background of Trade Unionist defeatism and timidity. Two of the workers sacked by Amey in September 2008, who had fought for reinstatement and compensation, recently lost their legal battle, which had lasted almost a year. A judge made clear on August 10th that the verdict was final and cannot be appealed: the plaintiffs had defamed the company by handing out leaflets where the names of Amey and its manager Laura Jordan were in bold capital letters, something deemed aggressive and ‘inexcusable’ in the English language. Julio Mayor and Pedro Rengifo thus lost the case, their jobs and the money they had been offered (an attempt to buy their silence: they refused with – and for the sake of – their dignity). However, they did not feel defeated… Failures can involve conquest too. It starkly displayed the persecution of immigrants organising for their rights and showed that solidarity exists. They learned from it, and kept fighting by themselves. They conquered fear and busted myths. It was an exhausting, instructive, long, drawn-out fight with hills and bends. “The Amey case” highlighted a common but deliberately ignored situation: the exploitation of “illegal” immigrants and persecution of those who organise (in unions or otherwise) against it; but above all, the undeniable alliance between employers, immigration police and state bodies to enforce immigration policy. Moreover, it means exploitative companies need not answer for their staff, exploiting them before casting them aside when they become an irritant. To avoid paying wages and improving work conditions, with the words “no papers”, they can have workers locked up. The result: thousands of immigrants mercilessly exploited, arrested then deported in a process denying them no rights and ignoring their protests. Hundreds of companies act with impunity, complicit in the employment of “illegals”: employing them in full awareness of their status, or even giving them the means and information to work… “legally”… An unfair “justice” where foreigners always lose. There have been other cases like Amey – before, then and since. Bosses hire immigrants, knowing them to be illegal; exploit them; the immigrants protest; Immigration “appear”; wages go unpaid; deportations keep stacking up; the exploiters do it all over again and nothing is done about it… They are not condemned, not penalized. That is perhaps why some people, determined to stop this cycle, immediately rallied round Julio and his sacked colleagues. CAIC (Campaign Against Immigration Controls) heard of the case and supported it with numerous demonstrations around England, which were also backed by No Borders, the Latin American Workers Association, universities, media, human rights organisations, groups and individuals across the country. Time was not on the five cleaners’ side, so they had strategy meetings mainly in working hours and Julio and his colleagues worked nights, Monday to Friday. Jorge Loaiza and Rubén Jiménez had abandoned the struggle because they had no time for meetings and tribunals. But Rengifo and Julio decided that they would keep going. Their memories stopped them from taking a backwards step, no matter whether they were with or without the unions, with others or alone. They remembered the events of May 2007 when three cleaners were deported and another four sacked. Days beforehand, the 36 Latin Americans employed by Amey to clean the National Physical Laboratories had determined their fate. Tired of accepting Amey’s abuses – and because they were organised – they began to protest when, without reason, the company decided to cut wages and staff numbers; doubled the workload; permanently re-assigned them, unjustifiably; and disregarded health and safety standards. At first they believed Amey would re-consider its behaviour, only to be betrayed: Amey called them to a meeting… at which more than 60 immigration police arrived. A raid, in which several were jailed. Those who survived this ambush re-doubled their protests, verbally and in writing, as individuals and publicly. This time they protested the injustices of working for Amey, and indeed because their workload was doubled when no-one replaced the deported workers. But they also protested the way in which Amey silenced their colleagues. They gave out leaflets explaining the situation, and shouted people’s names and their crimes. The consequences of their tenacity and courage were however unfavourable and gave little room for hope: they were sacked, because, in the employers’ eyes, “their actions damaged the company’s image”. Refusing to be intimidated, they demanded Amey appear before an Employment Tribunal, on grounds of unfair dismissal, racial discrimination and shortcomings in health and safety. They sought reinstatement in their posts and financial compensation for the hardship endured when they were forced to go without any wages. Then, on 10th February 2009, Amey met with them and their Unite and Prospect representatives. ACAS were also present. Amey wanted to make a deal and offered a third of the pay-off demanded, but no reinstatement. They told them that they needed an answer by the 17th: this was a “no”. The offer was “inappropriate and unfair, given the losses and hardship caused”. Prospect had advised them to accept Amey’s offer and withdraw the Tribunal case. They warned that if they did not, the “union would withdraw its legal backing”. Julio and his comrades knew they had to keep going by themselves, seeking representation independent of the unions, warning: “With them or without them we will continue onwards. We will continue fighting, whatever happens, even if we forfeit Amey’s offer”. Yes, they lost, but the experience was positive in teaching them that workers can appear before a Tribunal “without begging for unions’ representation. The unions acted as if they were offering a service to the workers, as if they were doing us a favour, rather than a service which we had previously paid for”. For this reason, there was success amid the defeat, because although they know that larger numbers have greater chance of victory, now they are not afraid to fight any battle – with support or not – and are determined “to continue helping workers win their rights” and offer their solidarity whenever it may be necessary. and resistance to the border regime in Calais. 20th August at 19.30 at the Emporium, 37 Stokes Croft, Bristol. In Calais, France just 20 miles from this island, around 1500 people live in makeshift refugee camps known as “the jungle”, they are there because of the UK border regime. “The jungles” and squats around Calais are self organised communities that have existed since the closure of Sangatte, the official refugee camp, in 2002. The residents of these camps face brutal daily gas and baton attacks by the police. At the request of the UK Border Agency, the French government has pledged to destroy “the jungle” by Christmas. People from Bristol “with papers” went to the No Border solidarity camp in June and have been involved in ongoing monitoring and drawing attention to the humanitarian crisis that has been created in Calais. Solidarity demonstrations and direct actions have taken place in both Bristol, Calais and elsewhere. Bristol NoBorders is working closely with both humanitarian and political groups and invites you to help create an effective transnational resistance.